A rare and beautiful very hardy shrub, with sensational winter flowers that smother the bare stems. 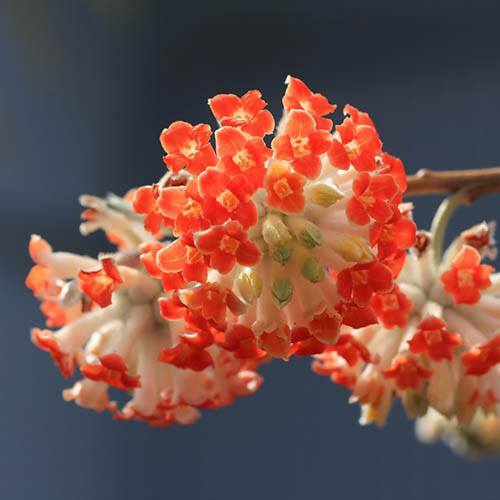 In mid-winter it produces produces clusters of scented red & orange tubular flowers, tough as nails in all weathers. Ideal for both pots and containers or garden soil, plant where you can enjoy the flowers and fragrance in winter. Fully grown in 5-7 years, it will grow to 4ft (1.2M) tall and spread. Supplied as a 2 year old plant 20 cm tall in a 13cm pot, to plant out any time of year. In late winter and early spring, before much colour at all (even before daffodils!) it produces intriguing red & orange lightly scented flowers, smothering bare stems as the flowers are produced before the leaves. It is a relative of the Daphne, sharing it's preference for cool, lightly shaded spots and is very hardy, requiring little or no maintenance. It will surprise you every winter for years to come! Supplied as an estalished 2 year old plant in a 13cm pot, about 20cm tall, ready to plant out. Dormant form Novemebr, so no leaves.